Who Wanted the State to Spend Tax Dollars on the UA and ASU Koch Centers? The other at Arizona State University (School of Civic and Economic Thought and Leadership), the later school receiving $100,000 to develop K-12 Civic standards. With each school receiving $1 million, the three universities had just $8 million in increased funding to spread out over the many programs offered at their campuses. What makes these two schools deserving of such targeted generosity by the State Legislature? Was there a grassroots drive by parent, student, faculty, or administrative groups calling for funding these centers? No. There was no such movement. Are these schools offering courses that are not readily accessible at other departments or schools like history or political science? Do the universities conduct nationally-competitive searches to staff these schools? Their recruitment apparently did not follow standard University hiring practices. Is a new K-12 “seal” of civic literacy necessary? Not when the Department of Education is in the process of finalizing new Social Studies standards that include civics and economics. So, why do these two schools get such preferential taxpayer funding and staffing consideration if there is no need and there has been no grassroots desire from the university stakeholders? It is because these schools subscribe to the philosophical dogma and patronage of the Koch Brothers, that they receive the favorable consideration of conservative lawmakers in this and other states across the country at the expense of other funds that could go towards education or priorities like Medicaid and hospital care. Since the 1970’s, the Koch Brothers, like other advocacy groups, have been utilizing their financial clout to promote their ideological agenda in the political, economic, and educational arenas. To that end, they have been subsidizing political candidates and “Freedom Schools,” and other educational programs at learning institutions like George Mason University, Florida State University, The University of Kansas, and Ball State. The University of Arizona and Arizona State University are recent additions to the Freedom School Ledger. Another university, Montana State, has voted not to join this network. What are the goals of these “Freedom Schools?” What needs are they trying to fulfill? Why do conservative lawmakers, who profess a love for limited government, generously fund these schools within university communities? At Arizona State University this process has taken multiple steps. Parsons and Dr. Matthew Garcia (formerly the Director of Arizona State University’s School of Historical, Philosophical and Religious Studies) relayed a process that started when a leading Arizona State History Professor and Scholar, Dr. Donald Critchlow, a recipient of Koch and other funding, started the Center for Political Thought and Leadership within the School of Historical, Philosophical, and Religious Studies. A distinguished conservative scholar, Dr. Critchlow, according to Dr. Garcia, endeavored to create a center that would attract intellectually and ideologically diverse students where all points of view would be entertained and discussed. According to Dr. Garcia, this arrangement worked well. However, without any indication from the community expressing a desire for a new school based on promoting a Koch-sponsored agenda and without any advance notice from the leaders in the legislature or the University Administration, the decision was made to take the Center for Political Thought and Leadership and create a separate school, known now as the School of Civic and Economic Thought. Dr. Critchlow (according to Dr. Critchlow in an email reply) was not involved in the legislative process that provided funding to this new school. He is actually stepping down from his current position as the Director of Political Thought and Leadership on July 1. A new director for the new separate school, Dr. Paul Carrese, formerly an instructor at the Air Force Academy, came on board along with other faculty members who fully subscribe to the libertarian beliefs the Koch Brothers foster. These faculty members were not recruited through the hiring process that included job ads and an elected search committee (Dr. Garcia says it and some of the program development was outsourced to other universities like the Hoover Institute and Harvard) and most did not qualify for exceptions to those practices because they did not bring diversity or elite scholarly credentials to the university. Recruiting students throughout the school’s first year has been difficult. With a university population of more than 100,000 students, the school has attracted about 120 students for its first school year. Incentives like a taxpayer-supported $500,000 purchase of rare books and trips (again taxpayer-supported) to India and a less costly venture to Sedona to hear Carol and Ken Adelman (two figures with Koch leanings) describe how Shakespeare’s plays illustrate characteristics in leaders may seem a misuse of the public coffers considering teachers have to go to the Ballot Box to fight for more education funding or when the legislature made cuts to Medicaid and hospitals. There is a worry that the Koch Brothers are undermining the tenets of public education and enlisting the support of the conservative lawmakers they financially endow (like Arizona Governor Ducey) to abandon their frugal attitude towards budgeting to throw taxpayer cash at these two schools to start to carry out these ends. Such as when the College Board was forced to redo its Advanced Placement History standards when there was an outcry from the conservative community. Another example is when Fox News Pundits criticized a recent new high school textbook in US History because it offered criticism of Donald Trump. 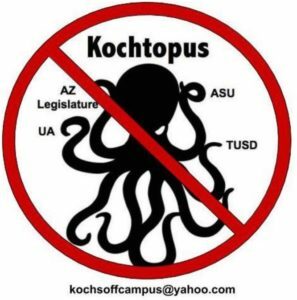 As the 2017/18 school year draws to a close, two of Arizona’s state universities house Koch-sponsored learning centers where the only people that seem to want them are Arizona state legislators in the pockets of the Koch Brothers. Wasting taxpayer money on schools that offer classes that are already offered in other departments and enticing students to join by sending them (again at taxpayer expense) to India seems to be a poor choice of spending the people’s money. As a candidate in Arizona Legislative District 18, Jennifer Jermaine said, when interviewing for another article, “the Koch Brothers could use their own money to develop their own centers if they want.” Using the “public dime” to fund schools that the majority of students, parents, and teachers want instead of Orwellian Indoctrination Centers would be a better use of the taxpayer’s money. Attempts to reach Katherine Paquet (referred to me by Dr. Carrese), Vice President of ASU for comment (three times via email) as well as leading Republican members of the Arizona State Legislature (Speaker Mesnard, Representative Townsend, Representative Allen, Senator Yarbrough, Senator Yee, and Senator Griffin) via email on May 15, 2018, have not yielded any replies so far. Below are ASU articles about ASU’s School of Civic and Economic Thought and Leadership (& SCETL school director Paul Carrese). 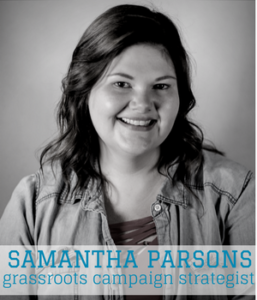 “The School of Civic and Economic Thought and Leadership is a new school in the College of Liberal Arts and Sciences that looks beyond time and borders to explore the fundamental questions of life, freedom, and governance. ” I include a few quotes. … For his part, ASU President Michael Crow expressed frustration with the Times article in an interview with The State Press on March 2. He rejected the ideas that the University is serving the legislature’s political interests and that SCETL is a bastion of conservative thought. “Yes, we have invited intellectual conservatives to speak, but we’ve had as many intellectual liberals speak, often in dialogue with a conservative. Look for yourself: video of all the Free Speech and Intellectual Diversity events, and our other public lectures, is on our website. Indeed, these caricatures of our school also omit the fact that Arizona PBS — not usually considered a puppet of right-wing operatives, dark money, etc. — is recording the SCETL series as the basis for its own series on free speech in our times. Look for yourself at the episodes available in the PBS series on their website (also posted on this SCETL webpage). Nor do any of these critics mention that our 2017-18 series is co-sponsored by ASU’s Sandra O’Connor College of Law and the Walter Cronkite School of Journalism and Mass Communication; nor is there mention of the range of professional and intellectual views among members of the series planning committee. As I mentioned when I contacted you about the Arizona K-12 Science Standards, I tried to enlist comment from at first Dr. Carrese who referred me to Kathy Paquet as the person to speak with. She did not respond to three email requests to meet. Furthermore, I emailed members of the Arizona Legislature on this matter. I am still waiting for those replies as well. Terrific piece David. Let me add one thing. It’s true that each of the centers got an added $1 million, but their previous year’s state money was turned into a baseline. That means this year, the UA programs got $3.5 million and, I believe, $4.5 million for the ASU programs. They don’t know how to spend the funds. At the end of the current fiscal year, UA’s program will have $5.5 million left over, and the ASU program will have $4.25 million remaining. The historical background of the Koch brothers, including ties to the John Birch Society, would provide some interesting discussion points. I wonder if the “Impeach Earl Warren” billboards are still standing in northern Arizona? “Freedom Schools” are scams to give propagandists a university address, which gives them the air of legitimacy. They are not legitimate. They create studies and papers that no one will ever read because they’re wordy pages of nonsense that read like an Ayn Rand creative writing assignment done on LSD. They will use “facts” from such debunked sources, reference other studies done by other Freedom Schools that include debunked sources, state fantasies as fact, cherry pick a few actual facts, and ignore externalities like environmental damage, human health issues, all while making the phony case that the very wealthy are oppressed, that the EPA are being big meanies to oil companies, that the poors like being poor, and that it’s a good thing that the wealth of the middle class is transferred to the top 1% of the 1%. The Arizona GOP is owned by the Koch’s, which is odd, because the Koch’s live in Kansas. Calling these abominations “Freedom Schools” is only the Koch’s nose tapping, though, the real genius of the scam is getting we the Arizona taxpayers to fund these phony think tanks that will used to create propaganda to steal more of our tax money. And once the centers were established, who asked for donor agreements that request that names of possible hires, along with resumes, go to donors? They promise not to exercise any input, but as your readers may know, George Mason University just got busted for allowing organizations within the Koch Brothers donor network to have input into hiring decisions. Real academic purity that, something to make the “academic freedom” folks very nervous. This use of taxpayer dollars REALLY needs to be taken away, and hopefully that will happen when a newly enraged and involved Red for Ed movement helps us vote the b**tards out!